For well over a decade, climate change action has been a priority for the Fraser Basin Council. One focus is on green transportation, particularly fleet managment. Under the banner “Green Fleets BC,” the Fraser Basin Council has worked on a suite of partnership initiatives to help public and private sector organizations increase fuel efficiency and cut smog and greenhouse gas emissions in their fleets. A cornerstone is our national E3 Fleet program, Canada’s only green review and rating service, which recognizes excellence in fleet performance. FBC is also proud to be part of Plug in BC, a partnership project helping to lay the groundwork for electric vehicles and charging infrastructure in BC. and trailers to BC roads. 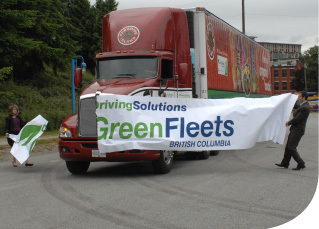 Between 2007 and 2009, FBC collaborated with the BC Trucking Association and others to support fleets in greening up. Managed by FBC and funded by the BC Ministry of Environment, the Green Fleets program offered education and incentives to help BC fleets managers and their teams better understand and introduce new technologies, alternative fuels, idling reduction policies and practices, driver education programs, advanced route planning and other progressive techniques. In all, 136 fleets participated in one or more initiatives. These included trucking, utility, urban delivery, courier and government fleets, as well as port terminals. Together they achieved some important emissions reductions in just two years — an estimated 23,200 tonnes of greenhouse gases, 150 tonnes of NOx and three tonnes of PM2.5. Off to a good start! aerodynamic improvements estimated to result in an annual per truck and trailer reduction of 17.5 tonnes of greenhouse gas emissions. Fleet managers in the pilot project reported up to 30% improvement in fuel economy. Interested in learning more? 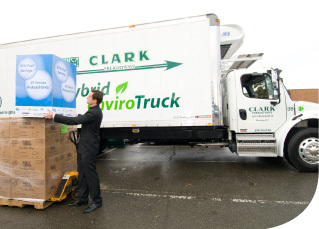 Read about clean trucking technologies and company experiences in the Green Fleets BC section of the E3 Fleet website. Green Fleets BC also hosted a fleet managers network to discuss green technologies and practices (including biofuels, fuel data collection, electric vehicle options and fuel-efficient driving practices) and to share their own experiences and strategies. The network proved popular, and the members enthusiastic. Some members worked up a common specification for Class 7 medium-duty hybrid trucks, for purchase by their fleets. Light-duty hybrid electric cars are recognized as commercially viable for many fleets. Medium-duty hybrid trucks, on the other hand, are just now gaining momentum. Green Fleets BC helped build understanding of medium-duty hybrid trucks and worked with eight fleets that piloted the vehicles. Medium-duty trucks include urban food and beverage delivery vehicles, bucket trucks used by municipalities and utilities for aerial work, and urban recycling pick-up trucks. The participants were Metro Vancouver, City of Richmond, UBC, City of Vancouver, BC Hydro, Canadian Springs, Fraser Valley Regional Library and Urban Impact Recycling. Idle Free BC was launched in 2006 to create awareness of the economic, environmental and health costs of vehicle idling, and to encourage local idling reduction programs. This was a partnership of the BC Ministry of Environment, FBC and Biofleet. Over 100 communities and organizations joined Idle Free BC, with measurable results for their fleet operations. The City of Williams Lake, for example, saved 20% on the cost of fuel in its fleet and additional savings on maintenance. For tools on idling reduction and community experiences under the program, visit the Idle Free BC website and the Climate Action Toolkit. By the mid-2000s, there was a need in public and private sector organizations across Western Canada to find reliable information on alternative fuels. Fleet managers wanted to know about biodiesel in particular, and how to safely introduce the fuel in their fleets of on-road vehicles and off-road equipment. Biodiesel is a clean burning, non-toxic, biodegradable alternative fuel that can be combined at any level with petroleum diesel to run diesel engines. It is produced from renewable sources such as canola, soybeans and animal fats. To meet the need for information, the Fraser Basin Council created and launched “Biofleet for BC.” The program offered educational workshops, materials, videos and data on biodiesel, along with opportunities for fleets to participate in biodiesel demonstration projects and document that experience. The work was possible thanks to the partnership contributions of municipalities, companies and fuel suppliers, and funding from Western Economic Diversification Canada. The Fraser Basin Council worked with other non-profit organizations in each of the four western provinces to deliver the program. Today diesel fuel supply in Canada must contain 2% renewable content overall, or 5% in BC under provincial requirements. Some fleets choose much higher biodiesel blends for regular operations as a way of cutting emissions. For a look at the Biofleet case studies, visit the publications archive on the Biofleet website, now hosted by Climate Change Central. In 2004 the Fraser Basin Council issued a report on the real-world performance of 100 hybrid electric vehicles, of a number of different makes and models. This project came at a pivotal point in the history of hybrids when fleet managers were keen to understand the technology, benefits and vehicle performance over time. The report documented lower fuel costs and significant reductions in air pollution. Some operators saw up to 60% in fuel savings over previous vehicles. The report found that hybrids were particularly well-suited to stop-and-go applications, such as urban commuting, taxis service, and courier work. Indeed, the taxi industry in Metro Vancouver has embraced hybrids for well over a decade as a cost-effective investment. It’s inspiring to meet fleet managers who are stepping up performance while pushing down emissions. You can read stories of innovation at www.greenfleetsbc.ca. It’s also a worth stopping by this FBC project site to learn about new alternative fuels and new technologies, and to keep up on our most recent transportation work.